Maryland Pink and Green: What's a Jicama? Jicama (hee-ka-ma) is a delicious Mexican vegetable that is perfect for hot summer days. The jicama is often called the Mexican potato and can be eaten raw or cooked. The jicama has a thick, brown outer skin that should be removed before eating. It is sweet, watery, and crunchy in texture and has a sweet flavor. Jicama can be found in your local grocery store beside other "exotic" fruits and vegetables like sugar cane and yucca. 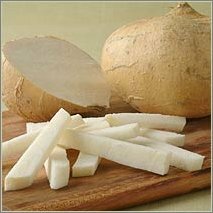 Although it can be tempting to get a large sized jicama, the small to medium ones are actually sweeter and better in flavor. Not to mention that it will be easier to cut a smaller jicama! Be sure that the skin is not discolored or damp. One of my favorite ways to enjoy this vegetable is spritzed with lime juice and chili powder. The calorie count is practically zero!! It's often paired with carrots prepared the same way. A fun variation for fresh jicama is to grate it with a large grater and eat the shredded vegetable. I love this. 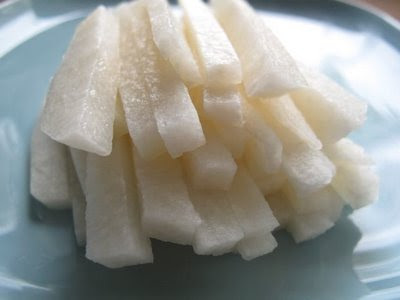 Although I personally have never cooked with jicama, I have heard that it is fantastic in a stir fry and is similar in texture to a water chestnut. Try this! Trust me, you'll love it! I adore Jicama! I discovered it a few years ago when I tried a fabulous grilled corn, red pepper, and jicama summer salad with lime zest. Love the crsip texture! Sounds wonderful. I have never tried one of these before. Thanks! I have never heard of this! I am going to keep an eye out for it :O) It sounds like it would be great in cole slaw! 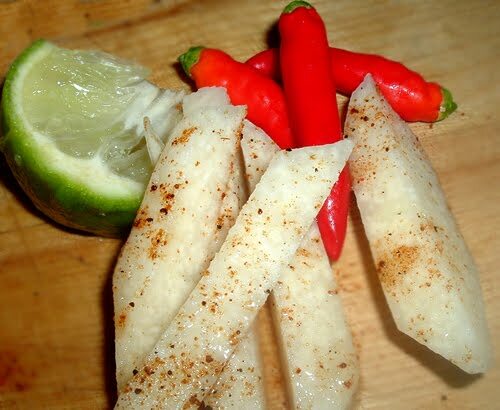 I've always been curious about Jicama, I'm certainly going to give it a try now, cutting it up raw with some chilli powder and lime sounds very refreshing!